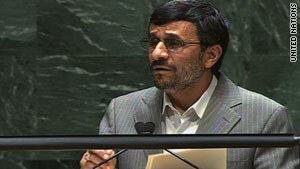 Iranian President Mahmoud Ahmadinejad speaks at the United Nations on Monday. Ahmadinejad called the weapons "a fire against humanity"
United Nations (CNN) -- Secretary of State Hillary Clinton faced off with Iranian President Mahmoud Ahmadinejad at the United Nations on Monday, accusing Tehran of "flouting the rules" of the Nuclear Non-proliferation Treaty and calling for "a strong international response." Iran "will do whatever it can to divert attention from its own record and to attempt to evade accountability," Clinton said at the opening of a monthlong conference on nuclear nonproliferation. Clinton called Ahmadinejad's comments at the conference earlier in the day, "the same tired faults and sometimes wild accusations" against the United States and other countries. The Islamic republic has continuously defied the U.N.'s International Atomic Energy Agency and its Security Council, Clinton said, adding that Iran was the "only country in this hall that has been found by the IAEA board of governors to be currently in noncompliance with its nuclear safeguards obligations." Iran's actions have "placed the future of the nonproliferation regime in jeopardy," Clinton said. She called on Ahmadinejad and his regime "to join with all the other delegations represented at this meeting to go ahead and fulfill our international obligations and work toward the goal of a safer world." Her comments came as the United States was leading an effort in the U.N. Security Council to impose tough new sanctions against Iran over suspicions their uranium enrichment is designed to produce nuclear weapons. "I hope that we can reach agreement in the Security Council on tough new sanctions," Clinton told reporters after her speech, "because I believe that is the only way to catch Iran's attention." Earlier Monday, Ahmadinejad -- the only head of state taking part in the conference -- criticized the United States and its allies for not providing "even a single credible proof" to substantiate their allegations about Iran's nuclear program. The majority of his 35-minute address was devoted to criticizing the massive U.S. nuclear arsenal and suggested the U.S. nuclear posture threatened other countries and justified their pursuit of nuclear weapons to protect themselves. He called the provision in the U.S. Nuclear Posture Review retaining an option to use nuclear weapons against countries a noncompliance of the very treaty it accuses Iran of violating. "Regrettably, the government of the United States has not only used nuclear weapons, but also continues to threaten to use such weapons against other countries, including Iran," Ahmadinejad said, referring to America's use of atomic weapons in World War II. He invited President Obama to join a "humane movement" setting a clear timetable for abolishing all atomic weapons, which he called "disgusting and shameful," and to provide security assurances to non-weapons states. Reaching out to developing nations, Ahmadinejad denounced an international system that he said favored the West and nuclear-weapons states while denying states like his the benefits of nuclear energy. U.S., British and French diplomats all walked out of the hall about 10 minutes into his remarks. Ahmadinejad also accused Washington of a double standard in its nuclear policy of seeking to reduce nuclear weapons but tacitly accepting Israel's undeclared weapons stockpile. He called for enforcement of a nuclear-free zone in the Middle East. "While the Zionist regime has stockpiled hundreds of nuclear warheads ... it enjoys the unconditional support of the United States government and its allies and receives, as well, the necessary assistance to develop its nuclear weapons program," he said. Clinton Monday reiterated U.S. support for a weapons-free zone in the Middle East, but said "the conditions for such a zone do not exist" without progress in peace talks between Israelis and Palestinians. The United States is working with Arab states and members of the nonaligned movement on an Egyptian proposal for a nuclear-free Middle East zone. In her remarks Clinton also proposed strengthening the nonproliferation treaty by introducing "automatic penalties" for noncompliance, rather than protracted diplomacy in the Security Council. She also announced a new initiative on stockpile "transparency," after which the Pentagon announced that the United States maintains 5,113 nuclear warheads in its stockpile and "several thousand" more retired nukes awaiting dismantling, marking the first time the United States has officially announced the previously top-secret figures. Clinton also announced $50 million for a new IAEA Peaceful Uses Initiative to spread benefits of peaceful nuclear energy.